I wanted to make a soup and I wanted to make it with regular white beans. But I only had lima beans. So, I said, what the heck, I’ll make a soup out of them. 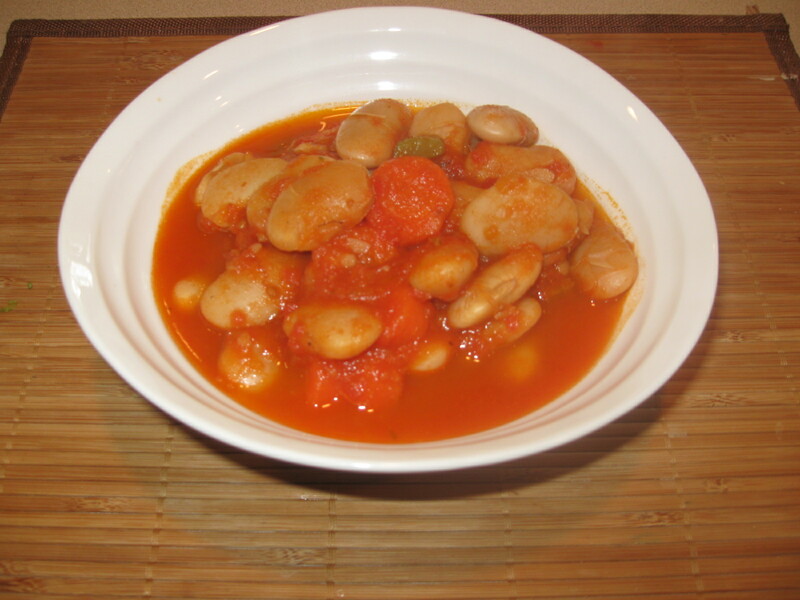 Lima beans are yummy cooked in the oven, they’ll be yummy in a soup. And so I did. No leftovers for the next day. How to make: Soak the beans overnight in a bowl of water. Strain and boil in a pot for about half an hour to 45 minutes or until crunchy soft. Strain the beans. In a deep pan, saute onion for about five minutes. Add carrots and celery and saute couple more minutes. Add tomato sauce and tomato paste. Add salt, pepper and optionally red crushed pepper flakes. I only added two because I wanted my kids to eat it. Bring to boil, add the beans, add more water to cover the beans and cook at low heat until the beans are soft. Make sure there’s always enough water. You can make it more or less soupy to your taste. Always taste the food and adjust salt and pepper as needed. Enjoy a beautiful vegetarian dish, rich in proteins and fiber.